A former plant for producing tractors as well as tanks (especially during WWII) located on the northern edge of the city of Volgograd, the former Stalingrad, in Russia. Destroyed in the Battle of Stalingrad, it was rebuilt soon after and resumed the supply of tanks to the Red Army, and that of tractors soon too. Over two million tractors were made here in total. Today, however, the plant is much less busy and partly derelict, but the large socialist-realist mosaics on the front façade as well as a T-34 tank on a plinth remain in place, as does a (rare) statue of the infamous Felix Dzerzhinsky. More background info: The tractor factory was set up in the second half of the 1920s, to the north of the already existing metallurgy/steel plant at the foot of Mamayev Hill, which would supply the required raw metal (also for the Barrikady weapons and ammunition plant that's located between the steel and tractor plants). The factory was named after Felix Dzerzhinsky, the founder of the Soviet secret police (which was to become the NKVD and later the KGB). His name was dropped from the plant's official designation in 1961, but a statue of the infamous man still stands in front of its main portal. Production of tractors began in 1930. In addition to regular wheeled tractors the plant also produced tracked versions. By the outbreak of WWII a quarter of a million regular tractors and 40,000 tracked versions had been made. During WWII the plant switched to the production of tanks, most famously the successful T-34 model, of which 250 units left the plant every month. This tank became the mainstay of the Soviet Red Army. You can still find countless examples of the over 80,000 T-34s produced serving as war memorials all over the former Eastern Bloc. One such example stands right outside the plant in Volgograd. As the German Wehrmacht reached Stalingrad in the summer of 1942, the tractor plant was the first target, and the first part of Volgograd the Germans managed to take, thus making it to the banks of the Volga too. During the fierce fighting over the next few months the plant was largely destroyed. It was also here that the last shots were fired in early February 1943, even days after the German 6th Army commander had capitulated. But a pocket of Wehrmacht soldiers still held out at the tractor factory until they too surrendered. After the battle, the plant was cleared of shells and debris and provisionally reconstructed within months. It started with repairing tanks first, but soon full-scale production resumed as well. From 1944 it also went back to manufacturing tractors again. It continued to thrive after the war and by 1970 one million tractors had been assembled, and the two million mark was passed in the 1980s. However, the collapse of the Soviet Union and the subsequent economic crisis of the 1990s in Russia hit the plant hard. Privatized already in 1992, sales plummeted to just 3000 (of the planned 80,000) in 1998. In the 2000s the company was split up into different enterprises, one building military equipment (such as light tanks), another still making (tracked) tractors, and yet another machine parts. Today the plant is operating on a smaller scale and parts of it are derelict or have been demolished. The main portal with its mosaics and the memorials in front of it remain in place, though. What there is to see: Not a lot, but enough to make the tram ride out here from the centre of Volgograd wholly worthwhile. 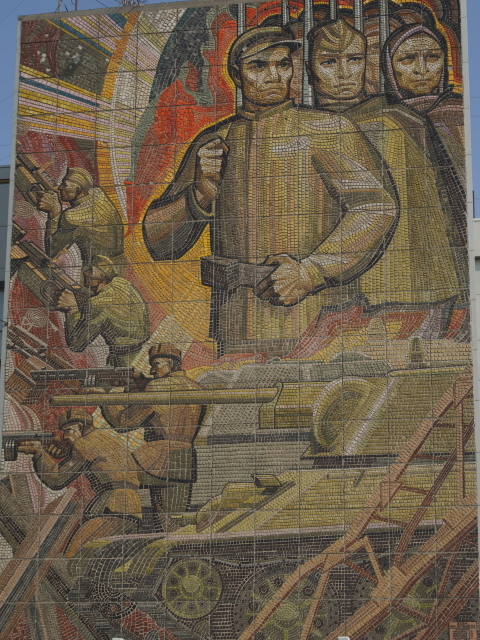 The main thing to see are two gigantic mosaics that in typical socialist-realist glorifying fashion depict muscular workers, Soviet hammer-and-sickle symbols and, of course, tractors and tanks. 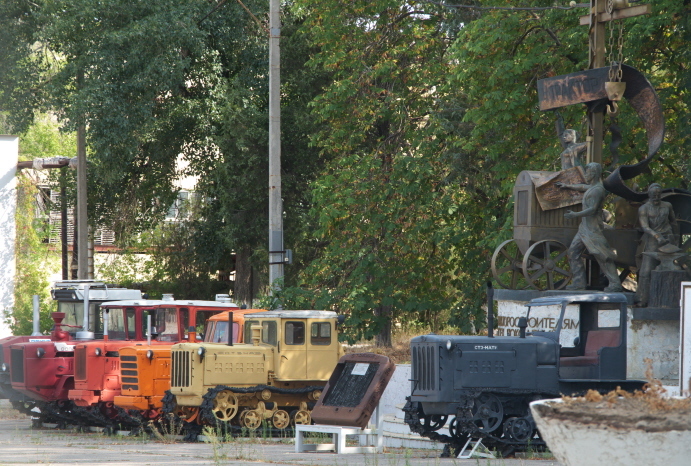 The one on the right of the main gates is the civilian version (with tractors and workers), the one on the left is the military variant (with soldiers and a tank). They're about as good as this quintessentially Soviet form of art gets. On the large, now mostly empty square in front of the grand portal are two memorials. First there is one of those T-34 tanks on a plinth that always signal that you are in the former Eastern Bloc (there must be literally thousands of such war memorials with T-34s). The other memorial here is a tall plinth with a statue of Felix Dzerzhinsky at the top, the goatee-bearded ur-Chekist, whose name the plant bore until 1961 (see above). He's pointing an accusing finger at the plant's gate as if still bemoaning the loss of his association with it in name. But seriously, it is an especially noteworthy monument because Dzerzhinsky depictions in this form are so much rarer than the ubiquitous Lenins, numerous Marxes and other heroes of communism, such as Kalinin, who also has a plaque at the front of the plant's gates. Yet more Soviet-era plaques, symbols and slogans adorn this main gate. But you can't go in. The best you can get is a peek through the bars at one point through which you get a glimpse of the row of tractors on open-air-display beyond the gate, next to some steely monument. There's apparently a small museum about the plant and its role in the Battle of Stalingrad on site too, but that can only be visited by prior appointment. I've read somewhere that some tour operators offering longer Stalingrad-themed itineraries include this in their programmes (try Three Whales for instance – see Volgograd and Gorky Leninskiye). I didn't see it, though, so I can't comment. This is it basically, except for a small soldier monument next to the entrance of the large shopping centre between the tram stop and the plant's gates. It consists of a single stone soldier statue holding a machine gun and a marble panel at his feet saying something like: “To the defenders of the city – the grateful tractor manufacturers”. Location: in the far north of Volgograd, in the district named after the plant, some 8 miles (13 km) from the city centre. Access and costs: a long (but uncomplicated) tram ride from the centre; free. Details: To get to the tractor factory, take the 'metrotram', line CT, which runs all the way from the very centre along Prospekt Lenina and up to the terminus at Vgtz/Вгтз (which stands for Volgogradskiy Traktorniy Zavod), where the tram goes round a loop before heading all the way back. From the terminus walk onwards past a large shopping centre. After less than half a mile (600 metres) you'll be by the gates of the plant and the big square in front. The square is freely accessible at any time, but you'll obviously want to be here during daylight hours. The museum inside the plant is only accessible by prior arrangement (which tour operators apparently sometimes do as part of their itineraries). You can't get in independently, as far as I can tell. And I have no idea what a visit would cost, separately. Time required: Only about ten to fifteen minutes or so at the site (more if you can get into the museum), but about half an hour by tram each way for getting there and for the journey back to the centre. The best combination, logistically speaking, is Mamayev Hill, the tram stop for which is en route between the centre and the tractor factory. On the way you'll also pass the other two huge industrial plants of Volgograd's north, the Red October metallurgy plant and the Barrikady weapons and ammunitions production site. Further north, on the very edge of Volgograd is another industrial site that some may find interesting: the huge hydroelectric plant and dam that makes the long lake between Volgograd and Saratov. Getting to the dam is either a long walk (over an hour), or you'd have to get a bus, marshrutka or taxi. Combinations with non-dark destinations: Nothing out here, head back to the centre of Volgograd.